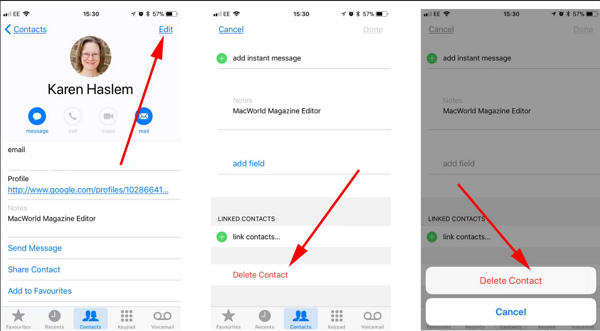 [Free iOS App] How to Bulk Delete No Name Contacts on iPhone? 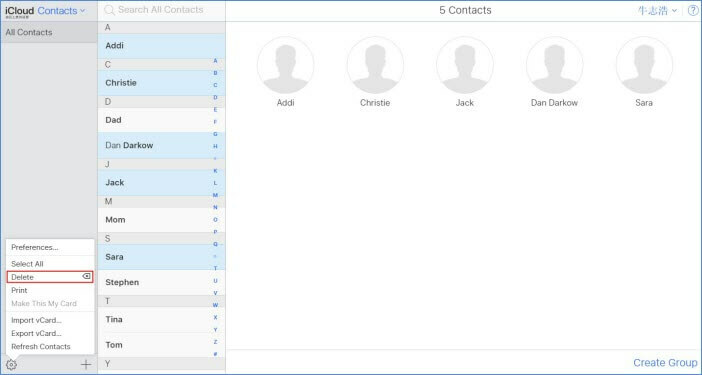 How to Delete No Name Contacts on iPhone/iPad? At some point as an iPhone user, you may notice that you have contacts on your device which don’t have a name. This can be an annoying scenario since you may not know which contact number belongs to whom. The first thing that comes to your mind when you see the no name contacts is how you can delete empty contacts on iPhone. In this article, we will be showing you exactly how this can be done. However, before you opt to delete no name contacts on iPhone, you can try fixing them. But, how can you fix these contacts? Let’s answer this question for you. There are various solutions you can use to try and fix the No Name contacts issue on iPhone. In this section, we will outline all these solutions. Not all of them will work for you. Therefore, try the first solution and then move on to the next if the first one fails to work. Step #1: Visit your iPhone Settings and then tap on iCloud. Step #2: Turn off the contacts and then turn them on again. Check your contact list to see if the problem is fixed. Step #1: Visit Settings and then tap iCloud. Step #2: Turn everything on. The iOS virtual assistant can help you fix your No Name contacts. 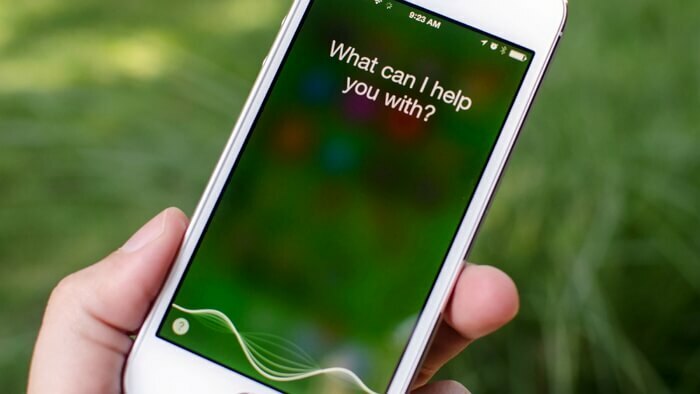 To use this fix, you just need to ask Siri to restore these contacts. 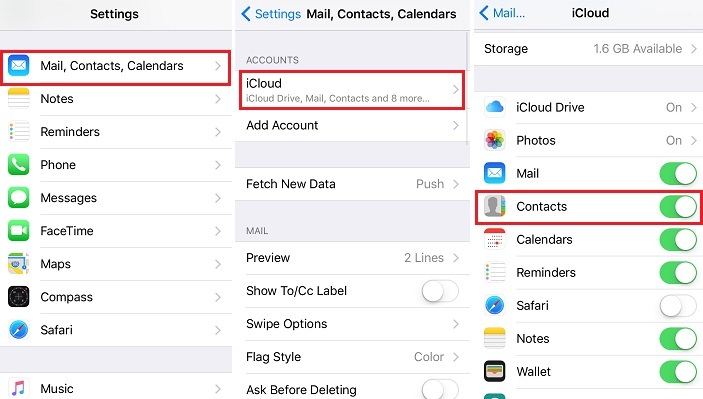 Step #1: Open settings and then tap Mail, Contacts, Calendars. Step #2: Tap on Add Account. Step #3: Click Exchange and then use your account details to add the account back to your iPhone. 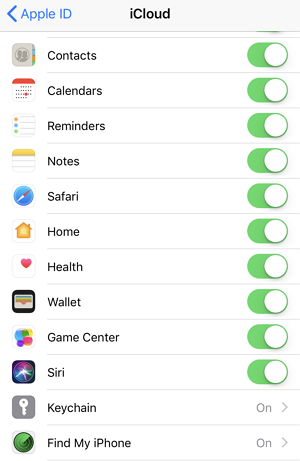 Note: if your iPhone is running on the latest iOS, namely, iOS 11 or later, then go to Accounts & Passwords under settings to proceed. 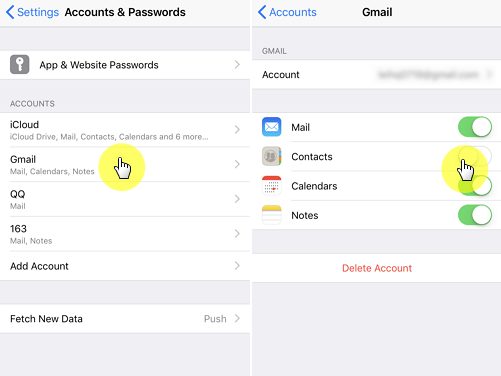 Step #1: Go to Accounts & Passwords under Settings on iPhone. Step #2: Tap on Gmail, and then toggle on the Contacts option if it is not on. How to Delete/Clean Up No Name/Number Contacts on iPhone? If you have already tried all the above methods and none of them has worked, you can consider removing the No Name contacts. 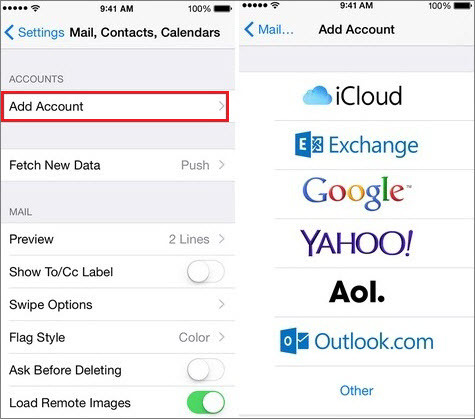 Below, we outline the methods you can use to clean up empty contacts on iPhone. Step #1: Open the Contact App. Step #2: Locate the No Name contact you want to delete and then open the contact page by clicking the contact. Step #3: Click Edit. Locate the Delete Contact option and tap on it. Confirm your action by tapping on Delete Contact again. Step #1: Visit iCloud.com and use your password and Apple Id to log in. Step #2: Select Contacts after you have logged in. Step #3: You should see iCloud contacts. Select the No Name contact you want to delete and then tap on Edit. Step #4: Tap the Delete Key and Click Delete again on the dialog box that appears. Step #1: Visit iCloud.com and log in using your details. Click Contacts. Step #2: Hold the Ctrl key and start selecting the empty contacts you wish to delete. Step #3: After Selecting all the No Name contacts, release the Ctrl Key. Press the Delete key and Click on Delete on the confirmation dialog box that appears. 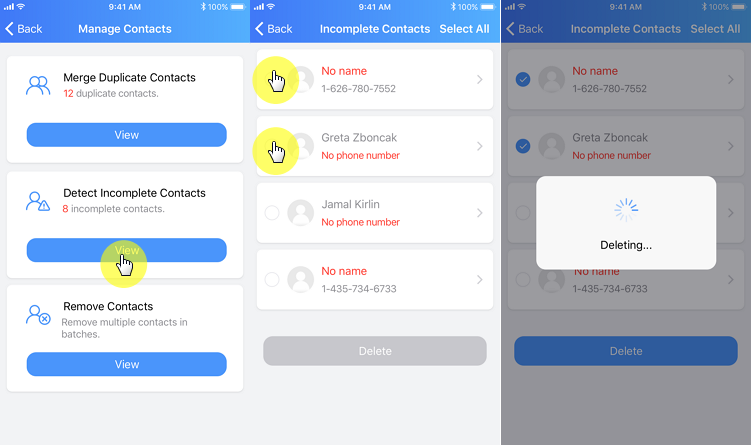 A better way to delete all the No Name contacts at one time is through the use of a third-party iOS application known as iMyFone iMyFone - Manage Contacts & Data. This application is free to download and use. The application allows you to back up your contacts quickly and easily, it allows you to transfer contacts from one iPhone to another without having to add them one by one, by using this app, you get to remove any undesired contacts on your phone in bulk. This iOS app is the best Contacts manager you can have on your iPhone. How to Remove No Name Contacts on iPhone? Step #1: Install the app on your iPhone and then launch it. Step #2: Select Manage Contacts and then click OK on the dialog box that appears to allow iMyFone to access your contacts. Step #3: Tap View under Detect Incomplete Contacts. Step #4: Select all the No Name Contacts and then tap on Delete. Confirm that you wish to delete the No Name contacts on the dialog box that appears. Step #5: Wait for iMyFone to delete the No Name Contacts. 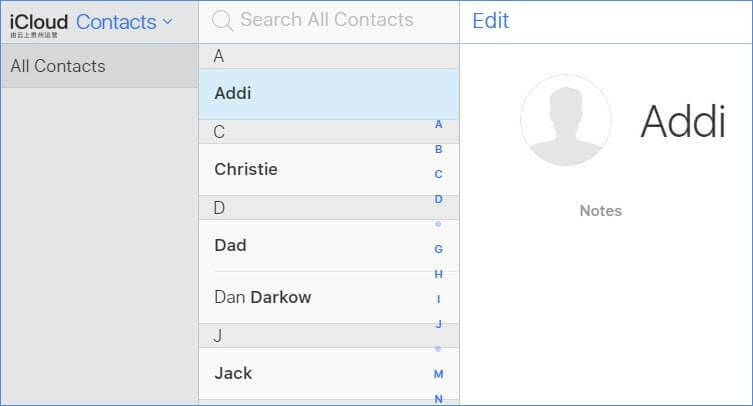 If you have No Name contacts on your iPhone, you should try the methods we have outlined in the first section of this article to try and fix them. If you can’t fix them, you can delete empty contacts on iPhone. Deleting them one by one will waste your time. Instead, using the iMyFone iOS app to delete the No Name contacts in bulk by following the steps we have outlined above will save you much time that otherwise will be wasted in deleting contacts one by one.